Rugged steel construction to handle heavy transporting, lifting and positioning work. 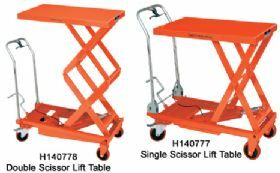 Table is easily raised by hydraulic foot pedal. Rolls on 2 fixed and 2 swivel casters for pinpoint positioning. Foot operated locks on swivel casters. FOB Shipping Point. Product No. Description Cap. (lbs.) Table Size W x L Max. Lift Hgt. Min. Lift Hgt. Overall Length Handle Height No. Strokes Wt. (lbs.) Price Ea.